Consumer Affairs is warning the public about a deceptive phishing e-mail being circulated in Bermuda, purportedly sent on behalf of The Department of Consumer Affairs. 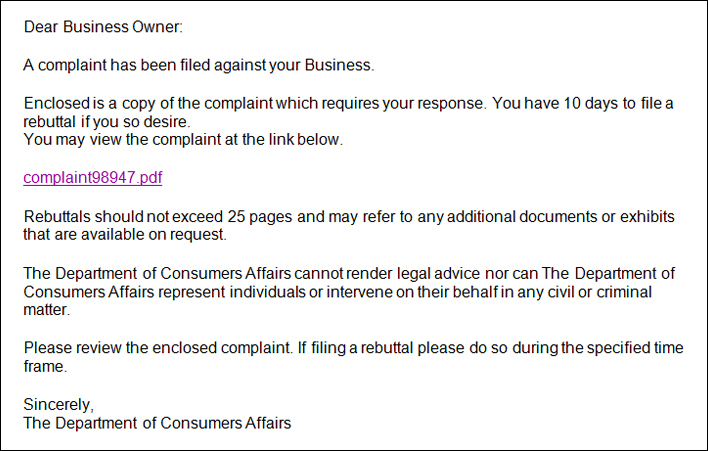 The fraudulent e-mail letter claims that a complaint has been filed against your business which requires your response to the attached link in writing within ten days. Karen Marshall, Executive Officer of Consumer Affairs said: “This e-mail was not generated or sent from our office. We would not send out via e-mail a letter of this nature; that is not the procedure we follow when notifying a business of a complaint filed against them. “Anyone who receives this e-mail is asked to delete the email and not to click on the link,” Consumer Affairs added. They should’ve warned us of this deceptive Airport deal !!!!!!!!!!!!!!!!!!!!!!!!!! !